Smooth cable containment from top to bottom. We don’t believe in leaving anything to chance. That’s why our cable basket containment systems also include bespoke ‘dropouts’, called waterfalls. These will keep cables secure between the horizontal cable network and the top of the data cabinet, and help make sure they don’t get bent or damaged as they flow into the containment system. The horizontal Cable Dropout DT2/100/HCDO/PG is 100mm width and installed by cutting 2 squares through the wall of the basket. 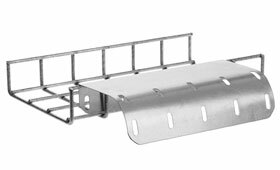 The sidewall mounted cable outfall DT2/200/SMCDO/PG is 200mm width and is fixed to the wall of the basket. 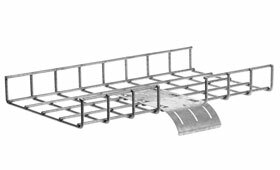 It is supplied with roofing bolts and a flat plate to suit the 50mm grid system of the basket. No cutting is required to install this product. Datatray (DT2) cable basket system is manufactured from pre galvanised steel and can be powder coated if required.